One of the special moments at the CWA Kandos Gardens Fair was a visit from Costa Georgiadis, in fact, two) from ABC’s Gardening Australia. We knew the Gardens Fair would be a very special event with him as a guest but his impact on visitors far surpassed expectations. As did the man himself. What a gracious, enthusiastic, engaging and energetic person! Costa had asked to visit the local schools as part of his visit which was a wonderful experience for the school children and hopefully will leave a permanent mark on the area. 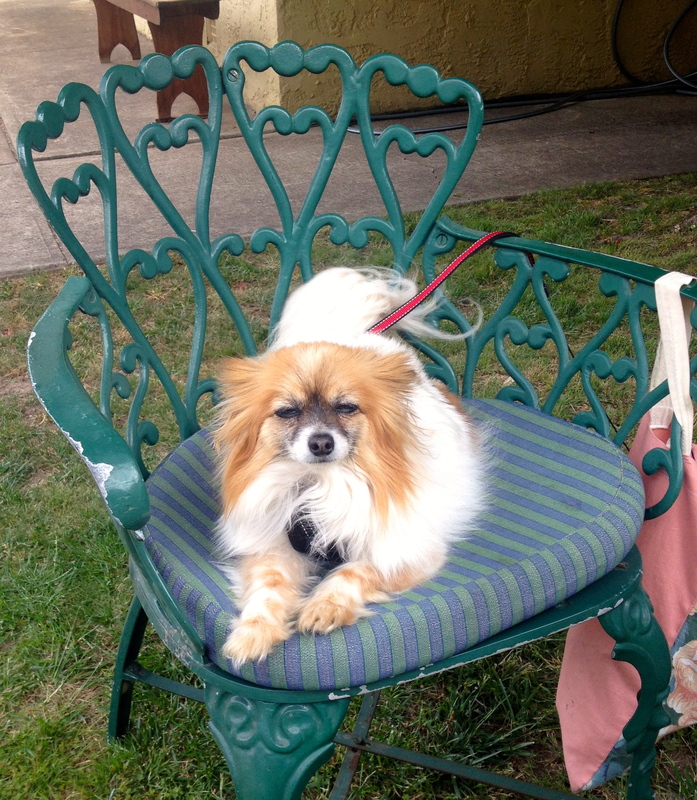 For the weekend, he tirelessly visited gardens, engaged with visitors and made himself available constantly. We were fortunate to have Costa visit us for lunch on Saturday where we gave him a short break from the many people who had built up both for a feed and to see Costa at the Convent. He made sure he spoke to all the volunteers and has a great skill for remembering names. He seemed to love the Convent and it’s surrounds (although I think he was equally gracious with all garden owners and guests) and on Sunday unexpectedly brought his Dad back for lunch and a quieter sit in The Cloisters on a day that was a little slower paced. Watching him with his Dad was a little bittersweet given my own Dad passed away last year and I had such hopes of he and Mum spending time with me at the Convent. It was great that he took his Dad on a guided tour of the garden but I had moments of concern with the wheelchair in the spongy grass! During their visit, a wonderful ukulele group sang and played in the Chapel – Costa raced in and took a video which he later placed on Instagram which was a thrill. All in all, a great weekend and we’re still buzzing from it. Costa certainly made a difference and we’d have him back any day. 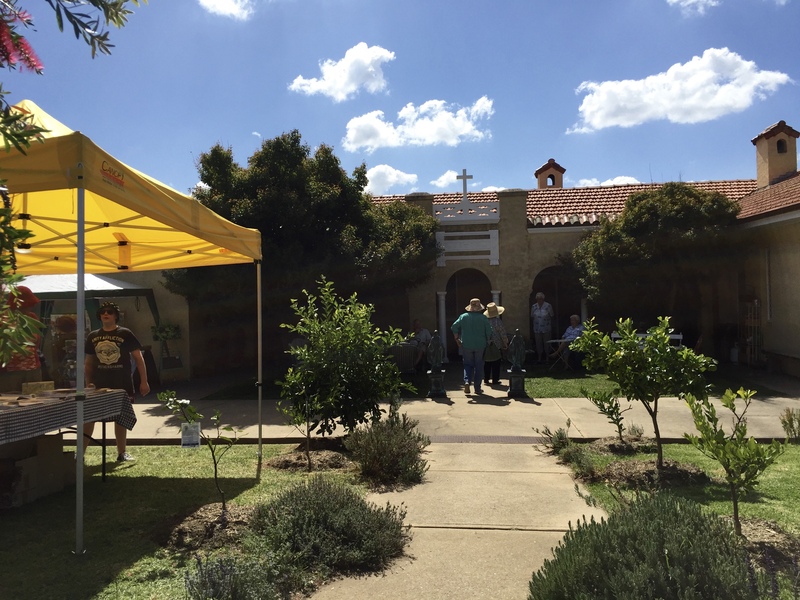 Last weekend we held our CWA Kandos Gardens Fair. A big event for our small town as it attracts many visitors, books out accommodation and showcases the area. This is the second time the Convent has participated, the first being just before I moved here permanently and in the early days of making over the garden. And what a weekend it was! 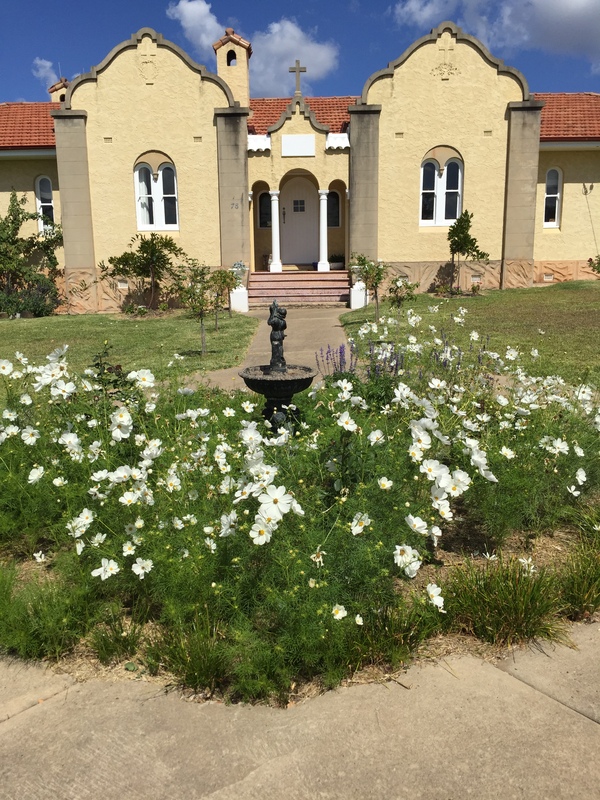 This time I was reasonably well prepared – the gardens were a little more established and in pretty good shape and we decided to offer morning/afternoon teas and lunches in the Convent Cafe, complete with a blackboard menu (which also meant heaps of food preparation). I have no idea yet of final numbers but the Convent seemed to be on everyone’s list as a “must see” venue, including a tour through the Chapel. We also attracted a few stall holders who set up their marquees, and local musicians and even belly dancers, the Kandos Belles! So there was no shortage of distractions. Food was in endless demand and we must have served 150 – 200 meals plus tea, coffee, slices and scones. Many thanks to my wonderful and competent neighbours who chipped in to serve so many people. Sausages rolls all disappeared within an hour, the zucchini slice didn’t last much longer and Saturday night I was up til all hours making more sandwiches and adapting to a change of plans preparing ingredients for Ploughman’s Lunches. We had a free cold drinks station with iced water, iced Mint and Lemon Verbena tea and Elderflower Champagne tastings. The Lemon Verbena tea and Elderflower Champagne were huge hits with visitors. The day had a great feel of festivities and fun but the Convent also provided a venue for relaxation and respite in The Cloisters out back where we held the Cafe. We were fortunate to have some special guest speakers come along including Fiona Ogilvie, the gardening journalist from The Land who has a wonderful property in Bathurst, Diego Bonetto, a wild food forager and, of course, the wonderful Costa Georgiadis from ABC’s Gardening Australia, who was incredibly engaging and generous with his time. More posts will follow with photos of the garden and our Cobwebs in the Garden knitting display (of course we’d get knitting in there somewhere!). Such a wonderful weekend and I’m sure all the effort from so many volunteers to put this together has been worth it. 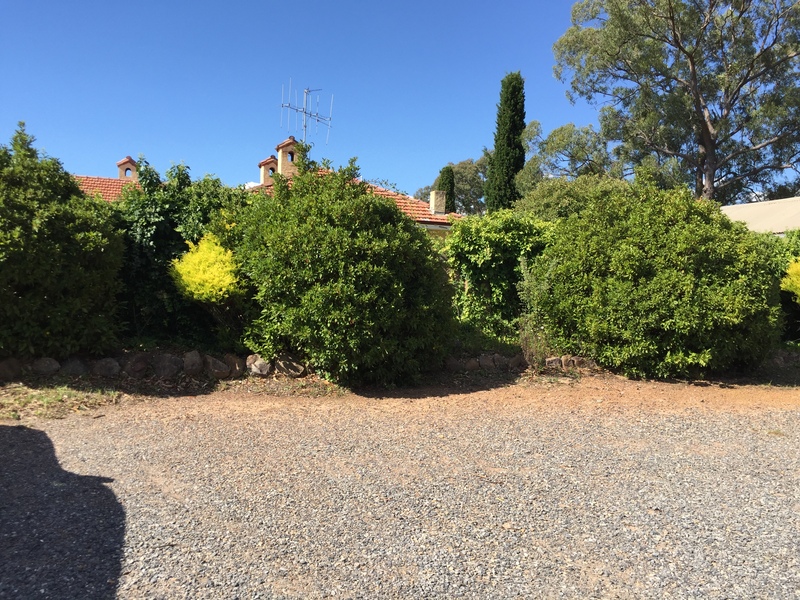 Less than four weeks to go before a dozen local properties in the Kandos Rylstone region open their gates to garden enthusiasts. 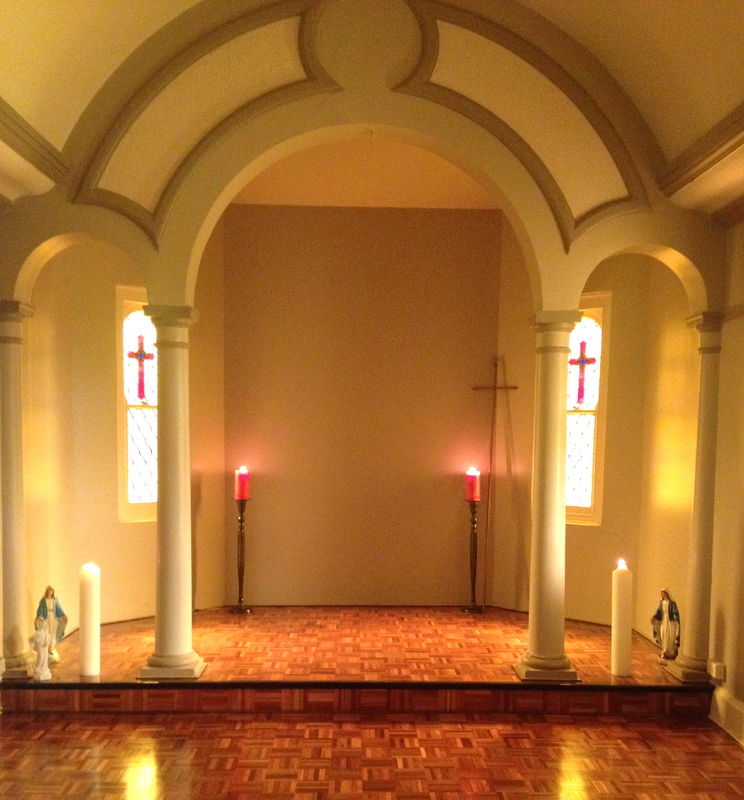 The Convent will again participate which means lots of preparations are afoot. I can’t remember the last time it rained – it’s been so hot and dry. Which is of particular concern for my garden given most of the plants are only a few years old. They’re not yet established and without deep root system, so at the moment there is lots of mulching and watering going on. I know our theme is “Gardening in a harsh environment” but this is a little harsher than necessary! 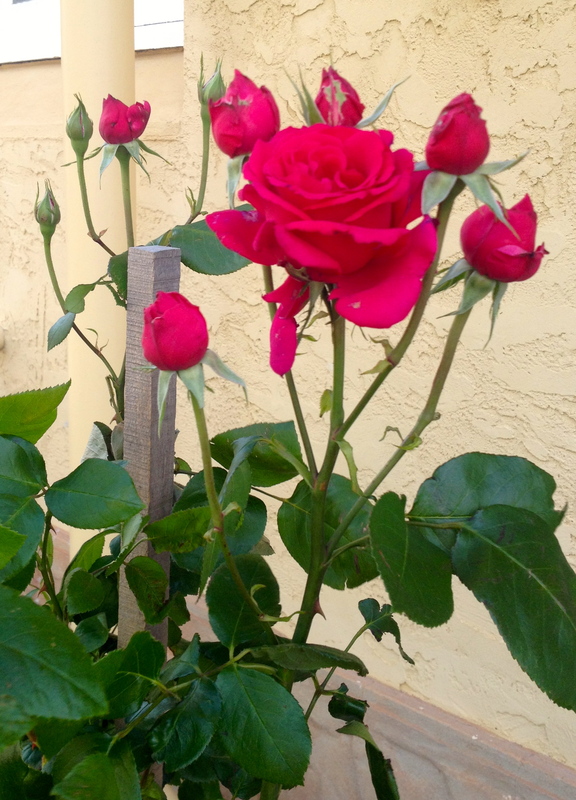 This week, the new trees were all heavily mulched and roses trimmed, fed and watered. I’m usually a little less structured with my approach, but this time I’ve been noting what roses I have and relabelling them for easy identification. I’ll probably do this as well with some of the more prominent plants to help visitors and any of the garden guides. Raised veg beds are all sewn. Hopefully I’ll have some decent new growth. Veg beds are also planted out and hopefully will look interesting and productive. Given most of my plants are young, I’m not sure exactly what will be flowering or still out by early April, but there should still be lots to see. Lots more to do, including cleaning up and painting some outdoor furniture, more feeding and mulching, sweeping, raking, whippersnippering and endless mowing… Hopefully we get some rain before the Garden Fair, but if not, at least we’ll have some good advice on managing in our challenging local garden conditions. The central garden bed. 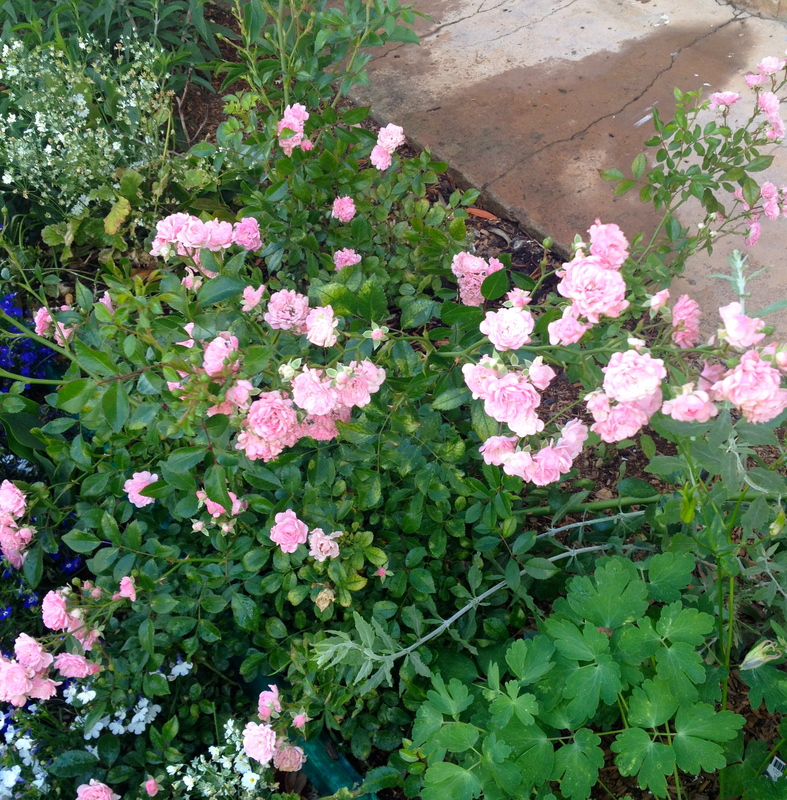 Hopefully the roses kick in and the white Cosmos come through by the time of the Gardens Fair. 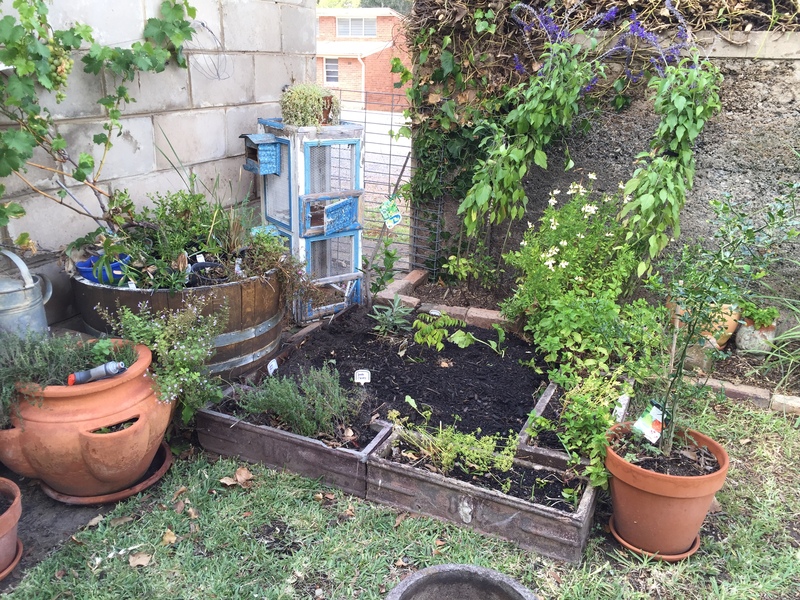 Previously a troublesome little spot in the corner, now a mini herb garden and “nursery” of sorts. 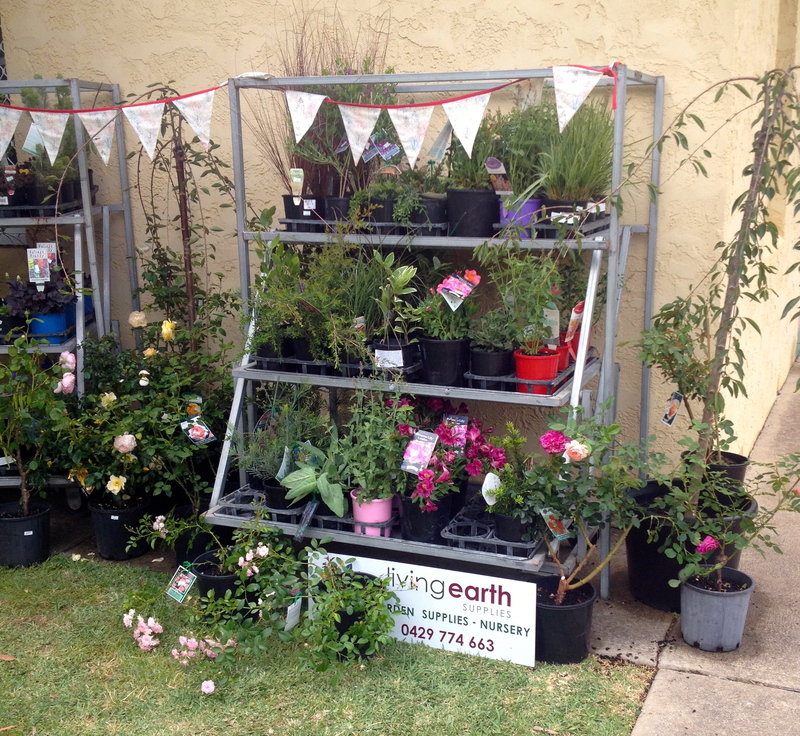 It’s less than two months now before the Kandos CWA Gardens Fair, which will be held on 2 and 3 April. And what an event it’s shaping up to be! 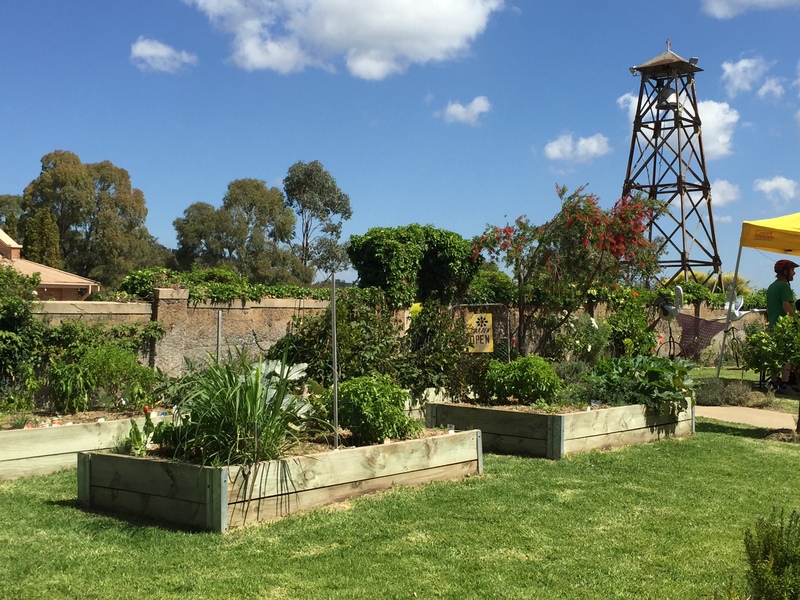 Headlining alongside Costa Georgiadis from ABC’s Gardening Australia is Fiona Ogilvie, gardening journalist, and Diego Bonetto, wild food forager, making it an essential booking for every gardener’s calendar. 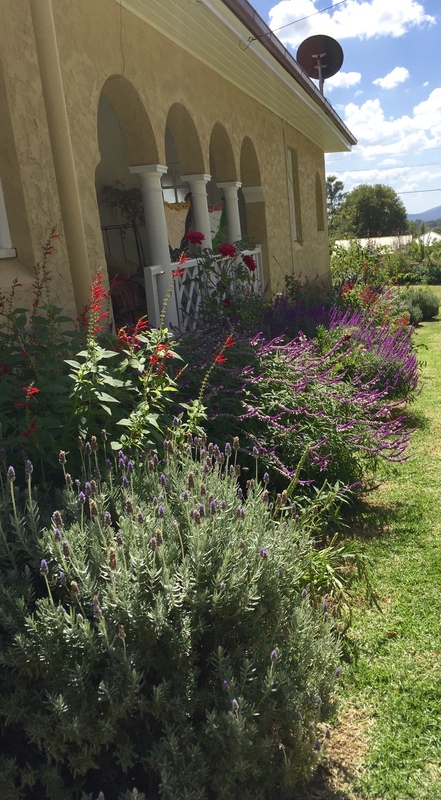 We have approximately a dozen venues ranging from “town” ones like mine to working country properties and an artists trail with the gardens of three talented locals just out of town. The back wall looking much neater. 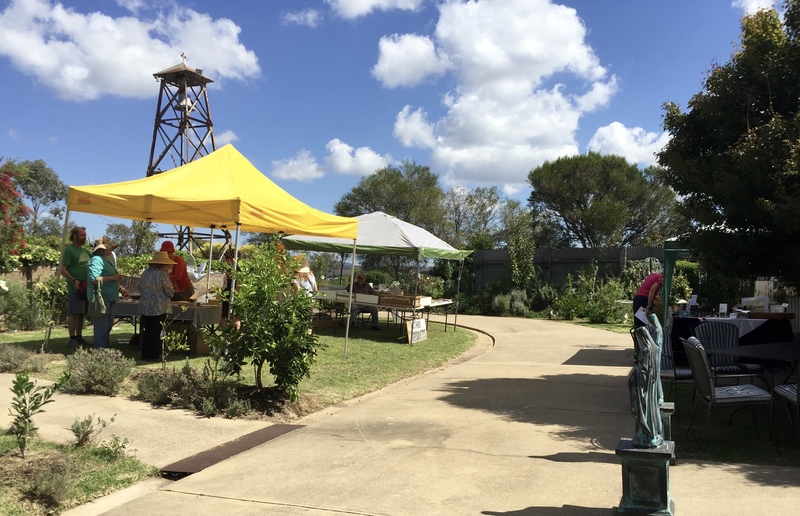 My garden was open for the last Kandos Garden Fair held in November 2013 – the year I purchased the property and just before I moved here permanently. 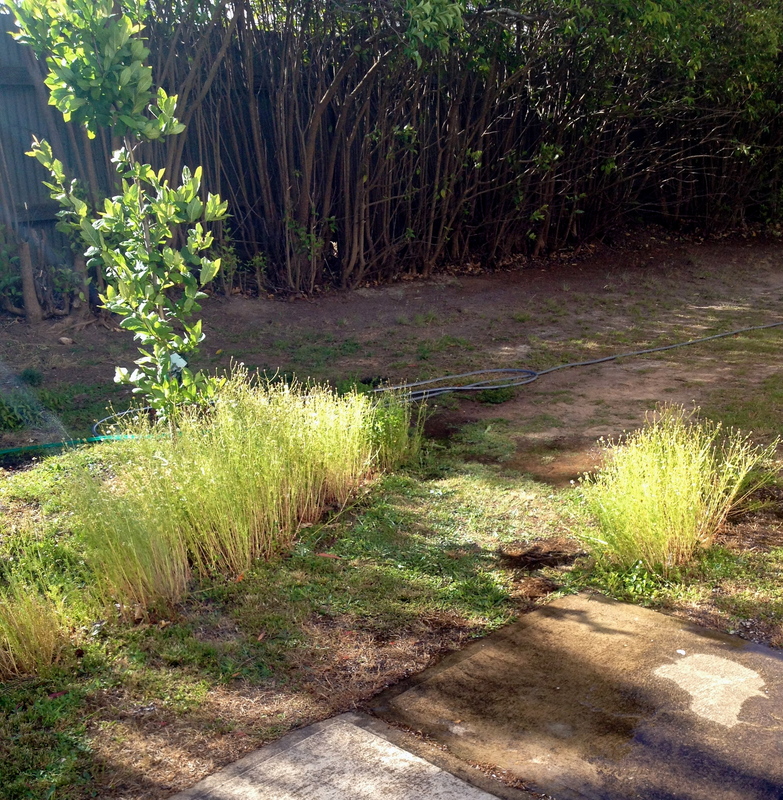 So the property was pretty bare – just the beginnings of a garden. I’m hoping people notice the difference this time around as beds have begun to establish themselves and the garden is taking on a semblance of structure. Over the last two weeks I’ve had some help – pulling in the big guns to clean up the ash brick wall that divides me from the Church. The back wall which fronts (or backs?) 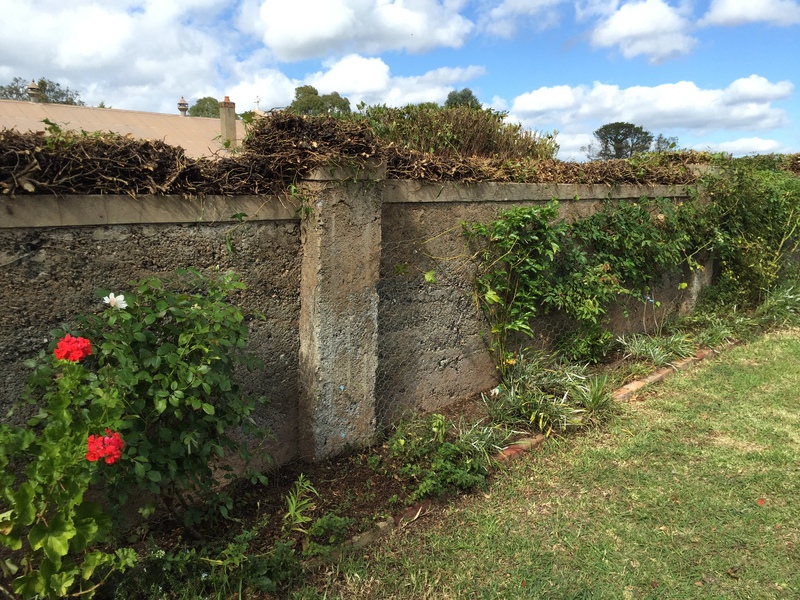 the Church carpark had large shrubs and ivy that was completely overgrown and dominating my back yard. The Church kindly agreed to let me clear it up and, with the assistance of some capable and knowledgeable locals, it’s now made a huge impact on my outlook. Whilst a bit bare at the moment, there should be lots of soft green new growth coming through by early April. The back wall before the pruning. The back wall after a little attention. For now I’m moving around the garden in sections, finishing off areas, trimming back, feeding and mulching – hoping it all comes up on the day. The garden is too new for me to be confident about what will be flowering in April and the weather will also have some impact – it’s been kind so far – not too hot and enough rain. But the threat of an early frost is always there! A few nights ago Gemma and I sampled the Elderflower Champagne– a nervous moment given I now have 15 litres of it made. But it was a winner. Fresh and bubbly, so I hope to be able to offer sample tastings at my garden. So now back to some more bottling! 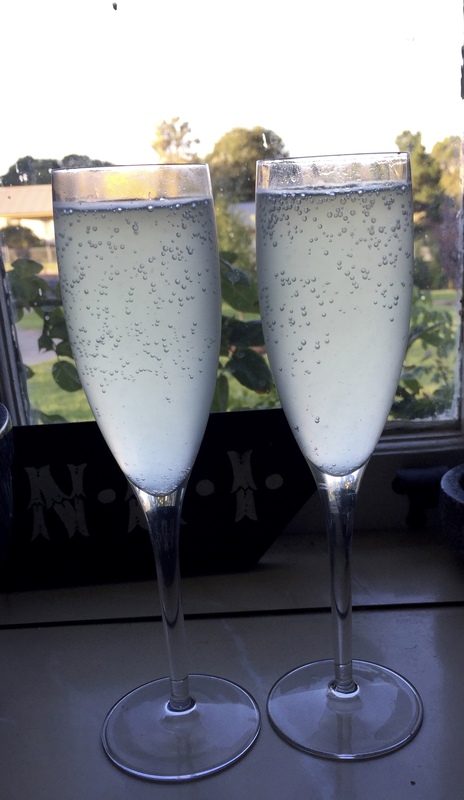 First batch of Elderflower Champagne – I’d call this a success. Another batch is currently in production and a few bottles are ageing in the cellar. 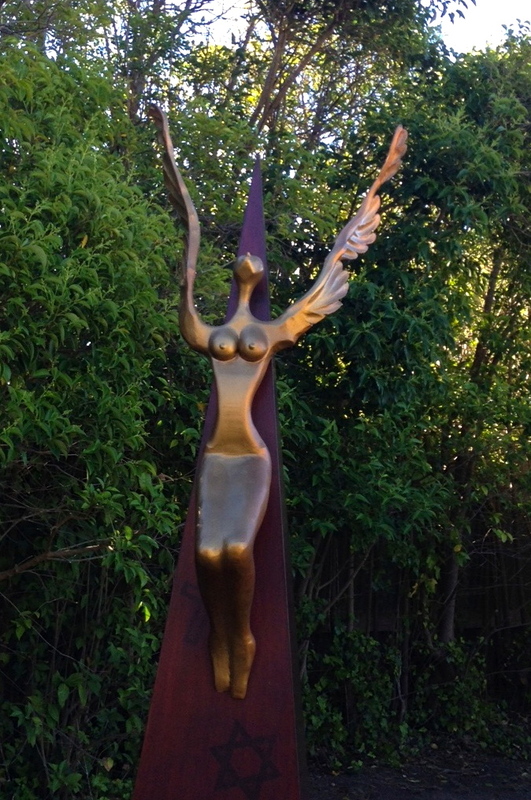 For the Kandos Gardens Fair, I was lucky to be provided sculptures from some of the local sculptors. 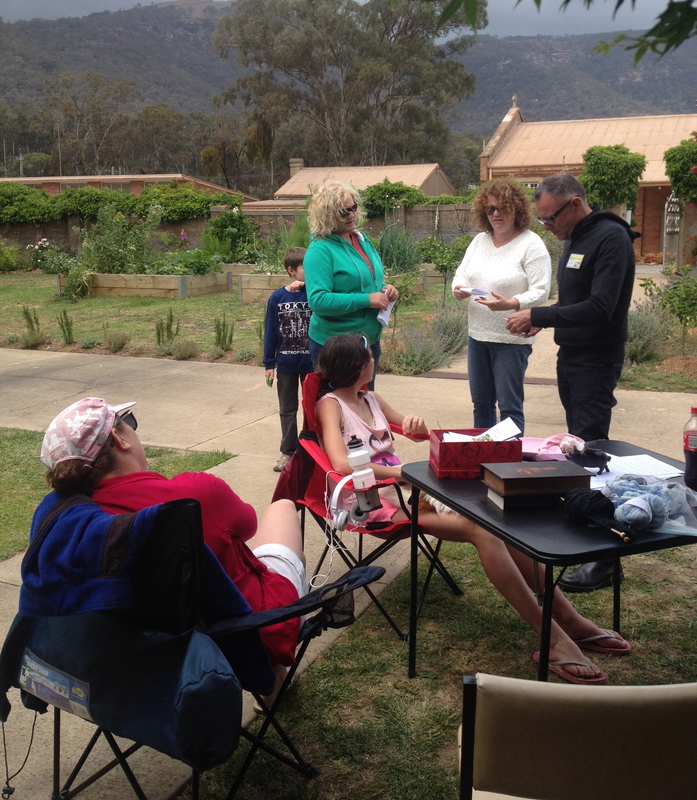 The Kandos/Rylstone district is home to many talented artists and craftspeople and it was wonderful to benefit from and display their wonderful creations. 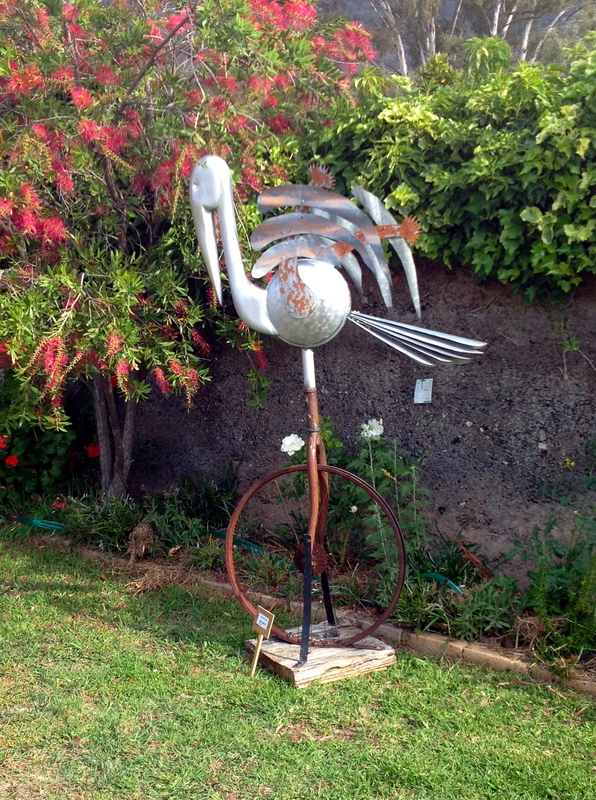 Firstly, attracting the eye of passers-by was ‘Glitch – Infiltrator Robusta’ by Mr & Mrs Brown, the talented and friendly owners of the lovely Brown Owl Gallery in the main street of Kandos. 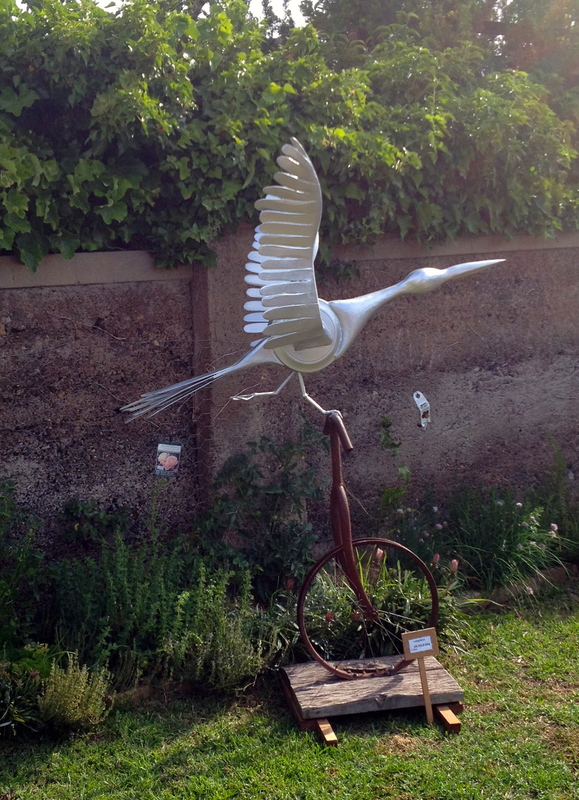 Ludwig Micek provided the “birds on bikes” – Balance and On Your Bike – that looked so at home positioned in front of the back wall and Follow Me was stunning and appropriate with a beautiful gold angel towering over the Grotto and visible from many aspects of the Convent garden. The sculptures attracted much attention and looked very comfortable in their settings. I hope I get the opportunity to showcase more talent in the garden in future. Well, we did it. 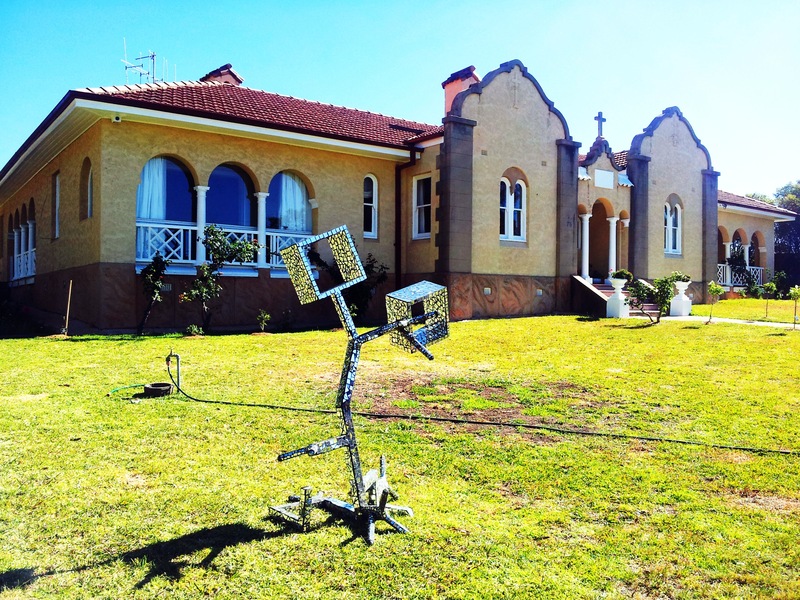 The Convent participated with other gardens in the district for a weekend of open gardens. I have no idea how many people came through but anywhere from 200 – 400. From locals who wanted to see what I’ve done with the building to people in Sydney who just love gardens. My Sydney friends acted as my volunteers, for which I will be eternally grateful, and it made the job so much easier for me. I met so many lovely people and now know many more locals. People seemed relieved that the Convent was being treated with respect and, if anything, was just going back to what it always should have been. The Chapel was open and did me proud. My garden was the “newest” in that most of it was very newly planted and was positioned as “in progress”. Many visitors were keen to see it in a few years time, particularly once the new roses have kicked in. Given I’m not a local and have planted things I love and experimented a bit, many commented that I had plants not often seen in the area but which seemed to be thriving and they were going to now try – which was particularly rewarding to hear. Whilst most of the roses (particularly the original ones) had finished flowering, some plants held back to show their best for the weekend. 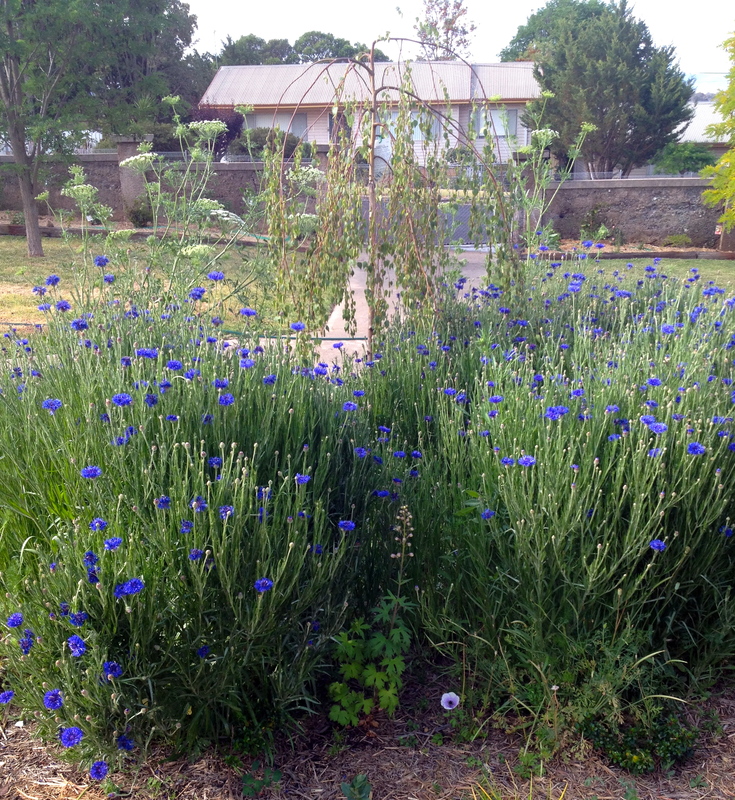 I think the cornflowers wanted to own the show and dominated in a few spots (and were much loved and admired). They worked well planted so thickly, which was quite unintended and I had no idea they would grow so high. Monday saw heavy winds and a number have now snapped and fallen, so the weekend was their pinnacle. By some strange fate, the Good Samaritan standards chose the weekend to be in their glory and were much admired. The Fairy roses also chose this to be their weekend. I knew the lovely little wisteria-like plants would be my downfall and had tried to find out their names to no avail. Many people asked what they were and no-one could help, including some seriously knowledgable people. Of course I accidentally stumbled across it straight after – indigofera decor. Bugger! 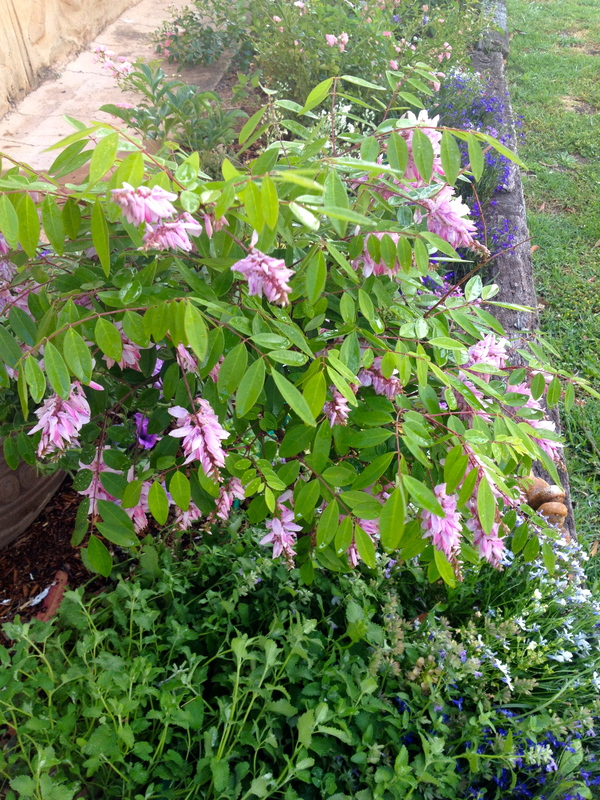 The name stumped us all – indigofera decor. Apologies to everyone who asked! 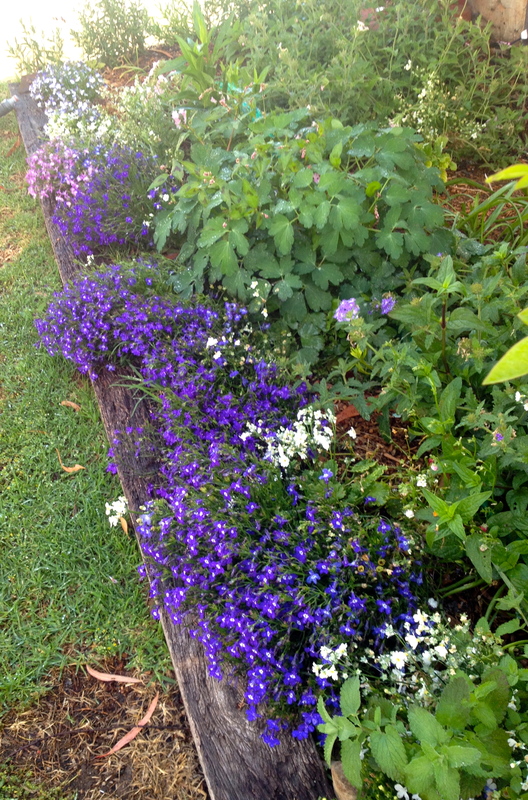 The verandah side garden bed (the pinks, blues and whites with the sparky lobelia at their best) was very popular, but everyone loves to poke through the veggie beds and identify food. The berry bed was a particular hit. Given my garden is so new, people liked to be able to look at all the tags. All the hard work out the front is not obvious from the street and people were surprised to come inside the gate and see that the front wall is now planted out with the deep sleeper planting beds. Sculptures (which I loved) and a plant stall all added entertainment and interest and we also served sandwiches, cake, tea and coffee, so had lots going on. There are a few learnings for next time, but would be happy to participate again and the Convent seemed to love the attention. 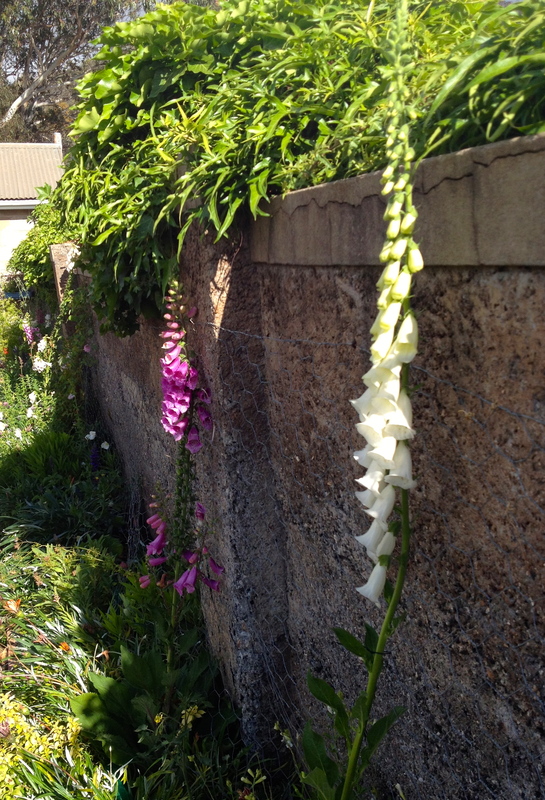 The Foxgloves on the back wall also chose their time well. Lots more of these and Hollyhocks next year!